What is so rare as a day in June? | Eating well, with creative recipes, to follow the Fasting Lifestyle according to Michael Mosley's "Fast Diet." This June has been beautiful so far: warm, sunny, not humid, light zephyrs playing in the trees. Bliss. We are still on the Plant-Based Fast Lifestyle. This means lots of whole grains, lots of vegetables, plant-based protein, and very little animal-based protein. But twice a week we eat eggs. Twice a week we eat fish and sometimes chicken is permitted. I always enjoy a recipe challenge! Heat the toaster oven to 325. Spritz a 1-cup ramekin with cooking oil or spray. Break the egg into the cup, and pour the half&half on top. Sprinkle with cheese, add salt and pepper to taste. Bake for 12-15 minutes, then let sit 2-3 mins. Plate with the toast, apples. Serve with your choice of black-ish coffee or tea, or lemon in hot water. Chili non Carne: The recipe is my mother’s, except that she used beef. And she served it on a heap of mashed potatoes, but we won’t do that on a Fast Day. Saute the onion and green pepper in some of the tomato juices until tender. Add remaining ingredients and cook gently until the stew is thickened. Taste to see if it needs more seasoning. 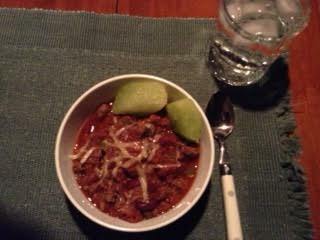 One serving = 1 cup chili topped with grated cheddar. I always think that cold, sweet melon is an excellent foil to hot, spicy chili. This is enough for 2 one-cup servings. Save the remaining chili for a lunch or watch for the next posting to see how we use it for breakfast!